• No uniform or children’s clothing will be included in this special event—only gently used adult clothing. 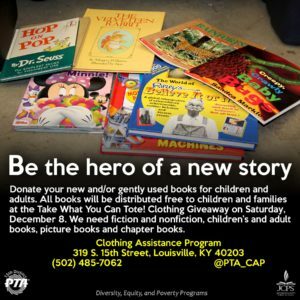 • Books for all ages and grade levels will be given away on a first-come, first-serve basis. Once the book allotment is depleted, no more will be available. • Families are limited to two large bags of clothing. Bags will be provided. • Clothing is available on a first-come, first-served basis. Once the clothing allotment is depleted, no more will be available. In case of inclement weather, Take What You Can Tote! will be cancelled and rescheduled for December 15, 2018. 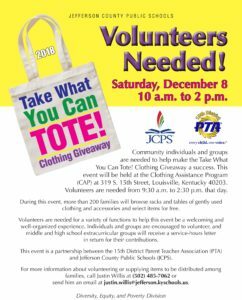 Groups of Volunteers are needed December 8, 2018. The available hours are 10 a.m. to 2 p.m. 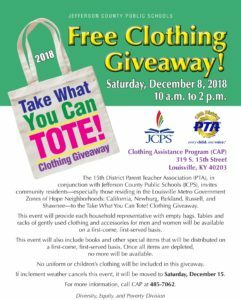 The 15th District Parent Teacher Association (PTA) will host the annual Take What You Can Tote clothing drive at the Clothing Assistance Program (CAP), 319 South 15th Street. More than 200 families will visit CAP during this time to collect free gently used clothing. Volunteers are needed to sort clothes, greet families, rehang new clothes, etc. Please call Justin Willis at 485-7450 (office) or 439-8782 (cell) to volunteer. •Moving boxes, crates, and palettes of clothing, shoes, and accessories. •Help this event be festive, welcoming, and operate smoothly. •Carry bags of clothing for families. Tabernacle Baptist Church, 426 South 15th Street. Volunteers will be provided with refreshment and snacks. For more information about scheduling your group to volunteer or to volunteer as an individual, call Justin Willis at 485-7450.